If you are looking for an uninhibited, hilarious, and unpredictable mature comedy film then you must see “Unfinished Business" in theatres. Vince Vaughn, Dave Franco and Tom Wilkinson form an unlikely trio of business associates with a target to close the deal that would change their professional lives. The movie started a little ordinary and as the story progressed it also raised some relevant issues in parenting and bullying. Dan (Vince Vaughn) is an example of a family-man juggling his work and pride, while trying to be the best father and husband to his loved-ones. The film is R-16 primarily because of the adult humor injected in the film's plot particularly on their trip in Germany. There might have been some slapstick and violent scenes that could be avoided. The party scene and art-culture in Germany is also discussed in a very liberal way. What I like about this film is that it kept the plot and sub-plot of the film intact through-out the film. There have been scenes where use of drugs and sexual acts were performed in a way that they appear very pleasurable - it would have been better if they have included some scenes that would remind the audiences that it is not morally right. What makes this comedy of “Unfinished Business" very effective is that it turns an ordinary event, the business trip into an extraordinary adventure. There have been logical and illogical events that have happened in the film that reminds us that "this is just fiction" but who knows, these peculiar events may happen in real life. 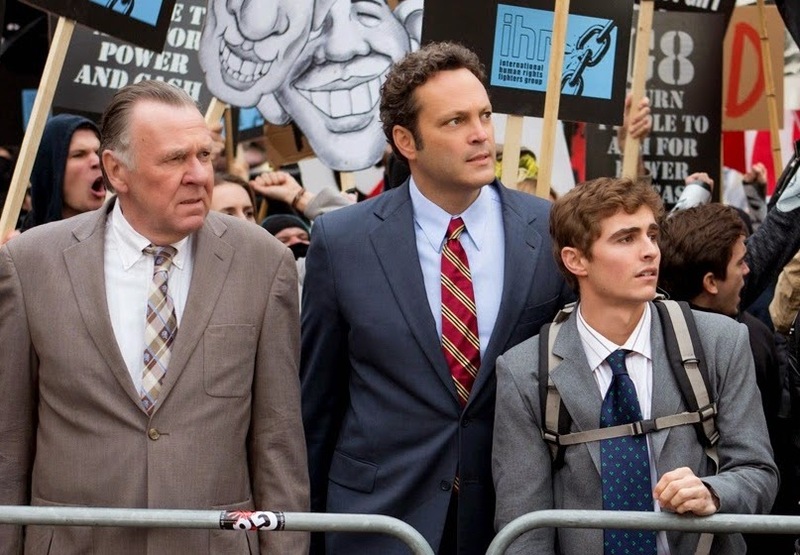 Vince Vaughn plays Dan, a small business owner whose company is on the brink of shutting down. In order to save his company, he must lock down a deal with some clients, but unfortunately, they are deciding between Dan and a giant corporation led by his previous boss (Sienna Miller). With no other options left, Dan and his employees (Dave Franco and Tom Wilkinson) travel to Germany to treat their clients to one hell of a business trip. "Unfinished Business" was directed by Ken Scott from a screenplay written by Steven Conrad. The most revealing fantasies ever said and done out loud for a man in his twilight years, Tom Wilkinson, who tries for the most doable one shade of Grey in the adult-rated comedy “Unfinished Business” along with Vince Vaughn and the über-talented Dave Franco. The innocent Mike (Franco) loses his virginity and the jaded Tim (Wilinson), trapped in an unhappy marriage, rediscovers a love for life in the exotic German capital while the relentless Dan (Vaughn) refuses to give up, no matter where his quest takes him. Learn from the unlikely trio of pros on how to get the job done and stay at it when “Unfinished Business” opens very soon this March 5 from 20th Century Fox to be distributed by Warner Bros.